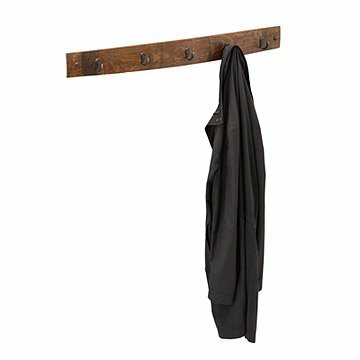 Make a rustic statement with this coat hook made from reclaimed wine barrels. Hang your coat on a piece of history. Made from reclaimed wine barrel staves (the bent planks that make up the barrel's sides), these coat hooks are perfect for the mud room or near any entrance, each piece is handcrafted and uniquely aged and patinaed. No two are alike. Handmade by artisans in Texas. Hook comes with holes drilled in each end. Hanging hardware not included. Included are "wooden buttons" to cover the holes once hung. Beautiful...I would buy another as gift. Used in entryway for keys and coats. Looks great! Hang your coats with character! Very well made, looks great in an office. The coat rack arrived damaged - one hook was broken in half. This really isn't surprising since the rack was not wrapped in any protective paper inside of the box. What is surprising is that the broken part of the hook was not in the box, which means it was placed inside of the box and shipped to me already damaged. I bought this for my son and daughter in law's 5th wedding anniversary (traditional gift is wood). They enjoy wine and just bought a home so I think this gift will be perfect. I opened it up first to see it, and I just love it. Very unique. I may buy one for myself too! This is beautiful! We hung it in our entryway and I could not be happier with the way it looks. I love the curved shape from the barrel and the rich color of the wood. So far its plenty sturdy to hang things on. I would definitely recommend to any wine lover! Looks beautiful online, stylish in person, but awkward to hang. Doesn't come with instructions or hardware. It's unclear how to anchor it to the wall in order to support the weight of coats effectively.